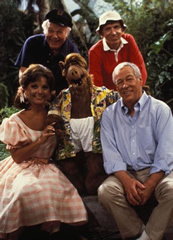 In 1987, four of the Gilligan’s Island castaways appeared on an episode of NBC’s sitcom, ALF. In the episode, ALF is addicted to Gilligan reruns and dreams that he’s on the island with Gilligan, Skipper, Mary Ann and the Professor. When asked where the others are, the four castaways explain that the Howells and Ginger have started an exclusive club on the other side of the island. It was the highest rated episode of ALF ever. A celebrity edition of Family Feud reunited actors Alan Hale Jr., Jim Backus, Natalie Schafer, Dawn Wells and Russell Johnson in a charity game against members of the casts of other vintage shows like Batman and Lost in Space. They did very well and earned $23,000 for the Motion Picture and Television Fund. Because Jim Backus was quite weak, he sat on a tall stool during the game but still offered very entertaining answers. Other minor reunions include Gilligan and Skipper appearing on The New Gidget and in the Annette Funichello/Frankie Avalon retro-movie Back to the Beach. Gilligan and Mary Ann appeared on an episode of Baywatch together. Some castaways have taken part in short boat cruises which allow fans the opportunity to meet them on a boat setting. Even Tina Louise joined most of the castaways (all except Backus) for the dedication of the Gilligan’s Island waiting room at the LA Children’s Hospital. In 1988, FOX’s Late Show assembled the first and only reunion of the Gilligan’s Island cast. All seven of the original castaways as well as creator Sherwood Schwartz discussed the show and their experiences with host Ross Shafer. Jim Backus was obviously in failing health but everyone else looked vital and energetic. The crowd went wild. In May of 1995, the four surviving members of the cast, as well as Sherwood, appeared on a Gilligan’s Island-themed episode of Roseanne entitled “Sherwood Schwartz–A Loving Tribute.” In the episode, Roseanne envisions her family as the castaways freshly shipwrecked. In the final part of the show, the actual Gilligan actors play the Roseanne characters with Tina Louise playing Roseanne, Dawn Wells playing daughter Becky, Russell Johnson playing Becky’s husband and Bob Denver playing sister Jackie. During the skit, Tina becomes upset over the script and stops the scene. She fires the writer (Sherwood) and says she wants the writer of The Brady Bunch. When he replies that he wrote that too, she promptly rehires him. The show has also been reworked in several different concepts without the original cast. Sherwood created a musical version of the show which has run with success in the Los Angeles area. There’s also been a reality show called The Real Gilligan’s Island which pitted two matching sets of castaways, costumes and all, against each other on an island with a Survivor-like theme. So what have the beloved actors done since the series? Have a bit more coconut creme pie, stick around and find out.